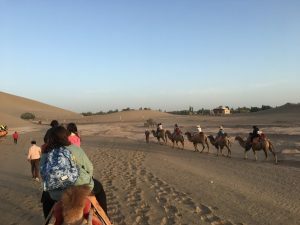 After braving a sandstorm and riding on the backs of camels out in the desert in Dunhuang, our group traveled Turpan in the Xinjiang province for our last leg of the Silk Road excursion. I know, when we realized that we were coming up on the last few days of the trip, all of us were feeling pretty bittersweet. 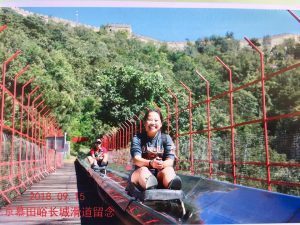 As you guys can probably attest from my tales in this blog, so, so much had happened to us, and we had crammed as many activities and sightseeing as we could in our short time. Two weeks had just flown by, and reflecting back upon it now makes it seem like it went by even faster than it really did. 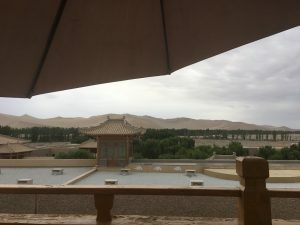 I’ll tell you about our times in Xinjiang now, and at the end of this post, I’ll let you know some of my closing thoughts and feelings about the trip. Disclaimer: I won’t be able to summarize all of my emotions into just some words on a screen in a blog — if I claimed that I did, then I wouldn’t be doing the trip any kind of justice. 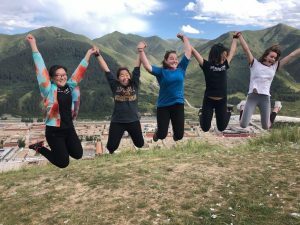 Our activities in the two cities that we visited in Xinjiang would mainly consist of having loads of free time for us students to explore. Since it was around the end of the trip, trip leaders had planned it so that our schedule wouldn’t be as jammed packed as it was during the meat of the trip. Regardless, we still had some group activities, so I’ll be talking about those mostly. First, a tiny encouragement to you guys who are reading this blog. Please take a moment to Google some of the events that are happening in the Xinjiang province. 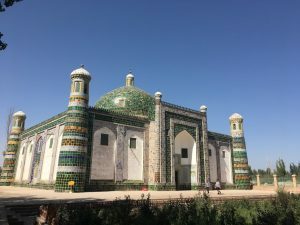 I think it will put our trip to this province a little bit more into perspective, and I think it will help you to understand my closing thoughts about this Silk Road excursion at the end of this post. Regardless, I am advocating it to be something that is important for you to know. Unlike most of our previous train rides, our train to the city of Turpan in the Xinjiang province was a bullet train, not an overnight train. Bullet trains are wicked fast and incredibly smooth because they run on magnetism, so the ride was only 3 hours long compared to the 5+ hours of previous trains. The inside of the train looked very similar to the inside of an airplane, with compartments where you could put your luggage and bags in overhead. I think spent the time trying to take a nap since I was exhausted from the day’s activities (we got onto the bullet train after we came back from riding camels in the morning in Dunhuang), but the inside of the train ended up being so noisy that I couldn’t get much rest before we arrived in Turpan. The Xinjiang province is China’s largest province to the west; its name literally translates to “new frontier.” Around 50% of its population consists of ethnic minorities, one of the largest of which are the Uyghur people, and its mostly an isolated region with deserts and grassland. 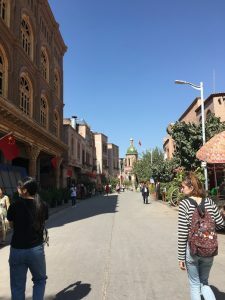 In both Turpan and later in Kashgar, we experienced Uyghur culture the most, through the food, the language, as well as the types of items that we would see being sold in the marketplaces and the bazaars, like beautiful intricate and handmade rugs and scarves. The Uyghur people are a Turkic-speaking people, among the oldest Turkic-speaking peoples of Central Asia, and their culture is more related to that of the Middle East, which is why, once we got off of our bullet train in Turpan, many of us students noticed differences between the Xinjiang province and other places we visited on the Silk Road, like in the clothing of the local people and the architecture. There were many times where I forgot that I was still technically within China’s borders. Soon after we got off of the bullet train, we met our tour guide for our time in Xinjiang, who was named Kevin. He was another one of our favorite tour guides because he was such an amusing character. He was this towering, lanky man who wore this hat that looked like a fishing boat hat and usually was swinging around a giant water bottle. He preferred to not say much, but his expressive facial expressions usually gave away what he was thinking. He was the type to make a face after someone said something rather than reply to it, which is why we students were amused to look back at him once in awhile to see what his reactions were to certain things in our environment. Kevin’s English was also had the most clearest accent out of all of our tour guides, which really surprised us, since he had only been studying the language for a few months. We praised his language abilities, since he knew how to speak Uyghur, Mandarin, and English very well. He was also just great company to have, and he himself acted like a TBC flag because he was so tall. Kevin led us through the security of the train station, and we got onto our bus to go to have dinner at a Uyghur family’s house, a family that Kevin knew very well. 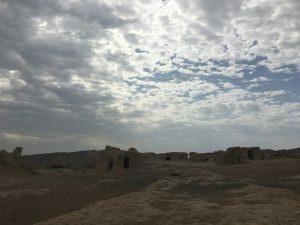 On the bus, tuckered out from our bullet train ride and our early morning activities in Dunhuang, I watched as we drove along Turpan’s dusty and eerily empty streets. By the time we got to our dinner location, it was still pretty light outside. 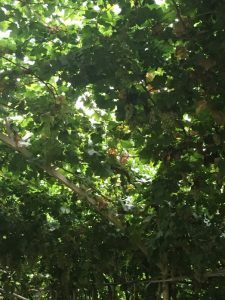 We were invited into the venue, which was outside but was surrounded by tall wooden structures covered by grape vines and leaves. There were enough that it basically created a ceiling for us. Look at all them grapes! Yup! Nearly every household in the Xinjiang region is involved in grape production, so having your own homegrown grapes was pretty common there! Kevin said that the grapes in the venue were free for the picking, and so while we waited for dinner to be cooked, a bunch of us wandered around the area, picking grapes straight off of their vines. They were very sweet and crisp, and they were a nice treat before dinner. After awhile, we were summoned back to the main room that had a few white circle tables set up with a turntable in the middle. For the next hour or so, we were served absolutely delicious Uyghur food, which included grilled lamb skewers (which was probably my favorite part of the dinner) and fried rice, noodles, a tomato and onion salad, and more. My mouth is just watering as I think about it. In addition, we were also given some warm tea, but it was served in a bowl rather than a cup! 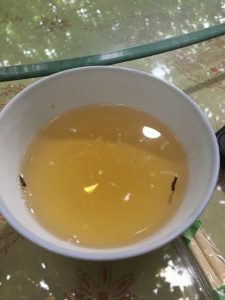 Some of that delicious tea served in a bowl. It had no hint of bitterness, which I thought was really nice. 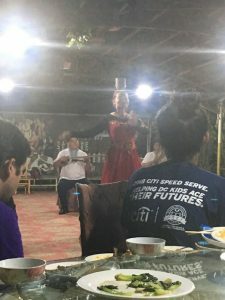 Once we were finished with dinner, the family played some traditional Uyghur music for us, and they also performed some Uyghur dances for us as well. The woman was dressed in a beautiful red and black dress, and the man was wearing a red and black man’s dress with trousers and boots. It brought smiles to all of our faces to see a mesmerizing performance, filled with quick spins and twists of the wrist. At one point, the woman balanced a couple of bowls on her head while she kept dancing and spinning! In fact, we had no idea that those bowls had been filled with water until she took them off of her head and poured the water into a different bowl! It was ridiculous! You can just barely see the bowls she was balancing on her head as she danced, with one of the instrumentalists in the background playing music. It wasn’t long until we were invited up to the stage to dance with many members of the family. We made a circle, and music played while we laughed and cheered as some of us students, one by one, were invited to dance with them in the middle of the circle. The way how they were invited were usually really cute — one man offered a bouquet of flowers to a student. It filled me with joy that night to interact with a culture that so warmly welcomed us to have fun with them. The dancing and singing only lasted for a short while before we had to say our goodbyes to get back onto the bus and check into our hotel for the night. The next day, we had a quick breakfast at the hotel before we got back onto the bus and headed to the Jiaohe Ancient City Ruins. 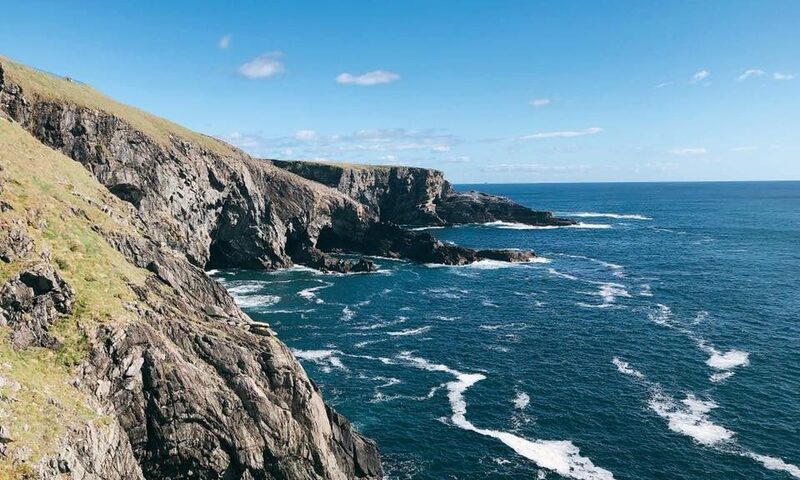 The city is located at the top of a plateau-like geological structure, with cliffs that are around 98 feet above ground, which gave the city a natural defense. Its buildings were built using what was available in the arid environment — clay. 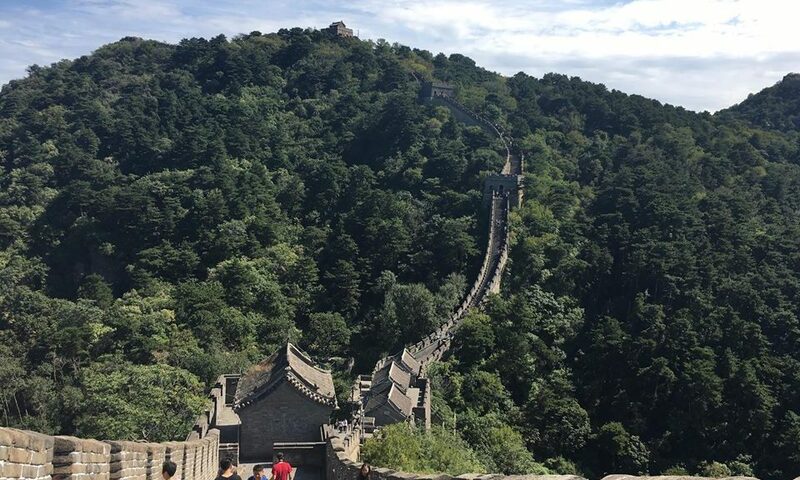 It dates before the 8th century, existing during the time of the Han Dynasty, before it was destroyed by the Mongols and subsequently abandoned. Turpan has a dry atmosphere and extremely minimal rainfall, which is why the structures were so well preserved. 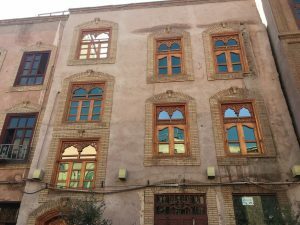 Kevin gave us a tour of the city, leading us through old roads that winded like a snake through the city, as we stared in awe at the strangely beautiful, still-standing buildings made out of clay and mud, literally thousands of years old. To think that we were walking along the same paths as people from thousands of years ago was quite unimaginable. One of the ancient gates to the city, sealed for thousands of years since the city was abandoned. At some point, Kevin lead us downstairs into an actual ancient house for us to explore. Not a replica of the house, but the actual house. 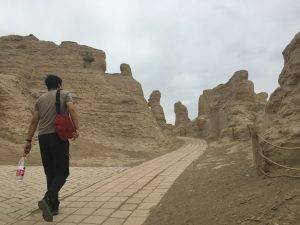 We were able to touch its rough clay walls, still standing strong due to Turpan’s dry climate, and we rested for a little bit on the step before we moved on. A cool panorama of the inside of one of the houses of the ruins! The weather that day was really cool, with a nice breeze. It was a cloudy day, but the clouds were kind of just scattered in the sky with flickers of sunlight shining through them, creating a really cool sight with the ancient city ruins in the horizon. Actually, while we were there, there was a tiny bit of a rainfall, which Kevin thought to be peculiar, since it had not rained for months. We thought it to be a lucky sign to welcome us to the region. Most of the rest of our time there was spent taking… you guessed it, some really neat photos! Another cool panorama of a part of the ruins! (…plus me haha). TBC at the Jiaohe City Ruins! After seeing all of the city ruins, we received some great news (not being sarcastic, there). 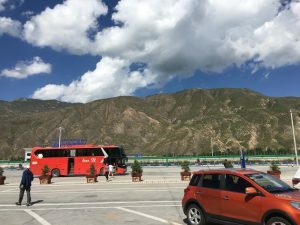 So original plan was for us to take a 3 hour drive to a train station in Urumqi, the capital of the Xinjiang region, in order to take our last overnight train get to Kashgar, our last stop on the Silk Road. 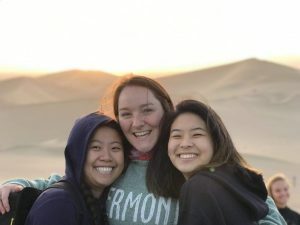 However, one of our trip leaders was able to get us train tickets from Turpan to Kashgar directly, cutting down at least 6 hours off of our travel time. The original train was going to be 18 hours, so you know that we all rejoiced when 2 hours of that ride was removed. 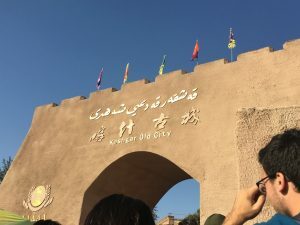 We arrived in Kashgar the following day around 10am. Because we were so far out west, the time zone seemed to be different than usual since it didn’t turn dark outside until around 8pm, but because there are no time zones like how there is in America, the time was the same as it was in Beijing. 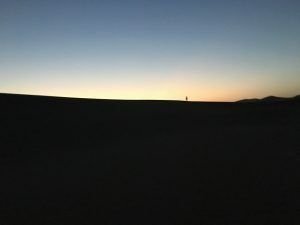 This caused some confusion for our circadian rhythms — it would be 8pm at night, but it would be perfectly light outside, so many of us would fall into the trap of going to bed really late at night. The population of Kashgar, like many cities in the Xinjiang province, is dominated by the Uyghur minority. The city, like how it was during the days of the Silk Road, is still a busy market town despite rapid modernization. Close by was what was called “Old City,” which is a long street that was lined with buildings that had market stands selling all kinds of trinkets. Most noticeably, Kashgar is known for selling its fuzzy soft rugs and its colorful patterned scarves in its markets, as well as its Uyghur-style street food. Our hotel was quite extravagant and would be our home for at least two days while we explored Kashgar. What I found the most amusing about our Kashgar hotel was that every time anyone from our group would come back to the hotel and went through security, the security guards would cheerfully greet us in English. I thought it was a friendly touch and allowed for us to calm our nerves a little bit from the day. The lobby of our Kashgar hotel. Kashgar was where we got most of our exploration freedom, so the days spent in Kashgar blur together. You’ll have to forgive my fuzzy memory! Once we checked into our hotel, we walked over to the nearby mosque and was given a tour. Unfortunately, and understandably, we were not allowed to take pictures while inside the mosque, but I can tell you that it was gorgeous and quite different from the Chinese-styled mosque that we visited in Xi’an. This mosque had no remnants of any kind of Chinese architecture. Afterwards, we took a bus to visit the Aba Khoja Mausoleum, which is a perfect example of Islamic architecture in China. It is the burial place of Aba Khoja, who was a local ruler, and it is also said to be the burial place of Ikparhan. Ikparhan, as we learned, was known to be the “fragrant concubine,” because of her distinctive, lovely scent. She was taken from her home by an emperor and kept refusing him until her death. Her scent is thought to be the result of a certain sap from a certain tree that Uyghur women use in their hair in order to prevent balding and to make their hair soft. There was such a tree around the mausoleum, where we were told the story of Ikparhan. Once we got back to around the area by our hotel, we were released for free time for food and for any exploration we wanted to do. The street that our hotel was on was ridiculously close to cute shops that my friends and I went into multiple times to buy stationary amongst other things. There were also delicious foods and beverages sold in the area as well. My personal favorite beverage that we got multiple times was this sour yogurt-y drink that was sold in what looked like a tiny mini bar outside. 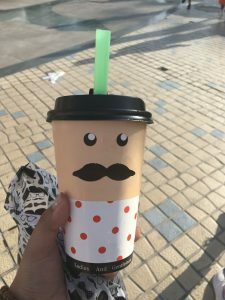 The drink was served these really cute cups! The bartender would chip off some ice from a literal block of ice into a bowl and then put some kind of syrup into the bowl before mixing it by tossing the liquid contents all together. He would do tricks by tossing the liquid really high into the air before catching it all cleanly into the bowl again, doing this multiple times before he poured it into a cup and handed it to us. For less than a dollar we got a delicious refreshing drink and some entertainment! During another one of the days, we visited that “Old City” that I had mentioned. This was basically a very long street that sold trinkets and street food galore. You were allowed to bargain for the things being sold, making your purchase feel a lot more… meaningful, than usual. Now that I’m back in Beijing, where everything is a set price again, I’ve been sad that I can’t bargain for a better price. That’s besides the point, haha. 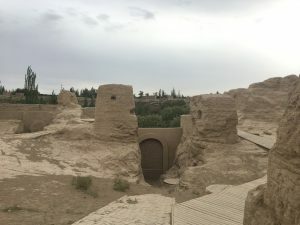 The buildings were different from all of the Chinese architecture that we had seen before on the Silk Road, taking more of a Middle-Eastern style of buildings. I’ve found that I love anything that’s a dough-package. One of these things only cost about 30 cents! Another day, we visited one of the largest bazaars in Kashgar: the Sunday Great Bazaar. It’s usually at its busiest on Sundays, which is exactly why we didn’t go on a Sunday. We were basically set loose for a few hours to browse all that each of the stands had to offer and to bargain, bargain, and, you guessed it, bargain. My friend group all were successfully able to bargain our prices to at least 50% cheaper than the original price, much to our delight. I unfortunately didn’t get much pictures of this bazaar since I was too busy shopping around (oops!). A bunch of street food and a lot of bargaining later, it was soon time for us to travel all the way back to Beijing. 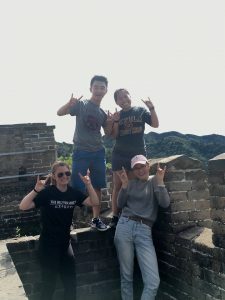 We had gone over 2,000 miles west from our campus in Beijing, and there was no way we were going to travel all of those miles back home in a single day by train. So, we took the next best form of transportation. An airplane! 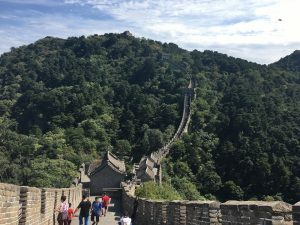 Our plane ride was about 6 hours, and we, thoroughly exhausted from our adventures on this Silk Road trip, settled in as we readied ourselves for a more routine schedule back in Beijing. During those 6 hours, I personally reflected on the trip (while I doodled some pictures, which is one of the ways how I tend to decompress and just absorb things that are happening to me and around me. I had bought a sketch book and a nice pencil in one of those cute shops in Kashgar), and here is where I discuss my overall final thoughts. I’m telling them now, to you all. 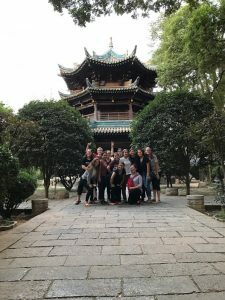 What I felt traveling across China to experience everything that we had experienced are still hard to put into words. I can only say “happy,” “joyful,” “amazing,” and other similar adjectives so many times before those words just cannot describe what I remember about those emotions anymore. So I won’t bore you with such words and phrases. But at least I can say that, inside of my memories and myself as a person, I can carry the true meaning of my memories and my emotions with me. Even if I can’t perfectly describe it, that’s perfectly fine. Perhaps one of the most important lessons that I’ve learned on this trip is that you don’t need to put words to a feeling all the time, especially if they’re all jumbled and complex. What matters more is what those emotions mean to you, what you will gain from them, and what you can give to others as a result of them. 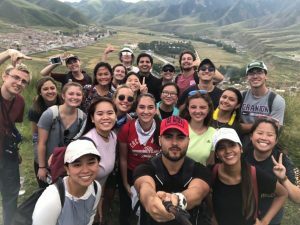 Many of the trip leaders had said that even though we all were taking the same trip together, all of us would have a unique personal experience on the Silk Road. I can kind of better understand what they meant by that, now. What we’ve gained from the experience is unique to each of us, and I think that’s such an impactful thing. I’ve been given this an amazing life experience, and that’s priceless. For the gift of exploring my own self while being submerged in various cultures and histories, I want to express how grateful I am to have had this incredible opportunity. There was no way I could have prepared myself for such an experience, but it would be an understatement to say that I’m glad that I, and my peers, took the dive. 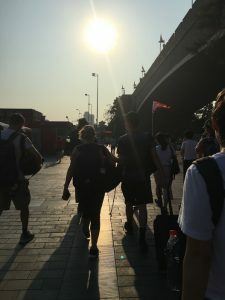 One of the trip leaders, a professor who was a brilliant resource to us during the trip (I have the pleasure to have him as a professor this semester), said something to us on our way to our very first overnight train to Xi’an. It has continued to resonate with me, even now when it’s been a few weeks since we’ve returned to Beijing. I think it summarizes the trip very nicely and captures the essence of what I’ve been trying to say in this jumble of final thoughts. And boy, do I remember where I’ve been. 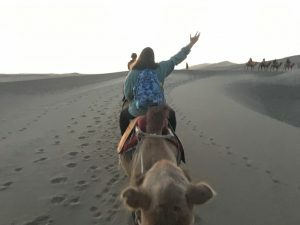 I want to thank everyone on the Silk Road excursion for giving me such rich and beautiful memories that I’ll remember for the rest of my life. The sites of our trip were amazing, yes, but honestly, it was the people that I traveled with and shared the experience with that made the trip that much more incredible. 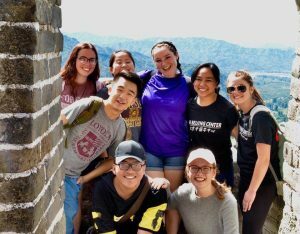 The friendships that we forged together and the travel that we embarked on together in this rich and amazing country are precious times that we would have never been able to do if it weren’t for this program, The Beijing Center. So thank you, everyone at TBC! 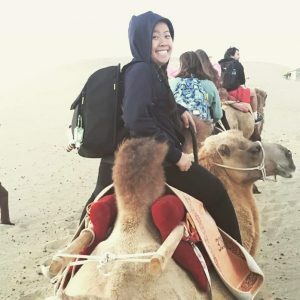 I also would like to thank the Travel Bible (aka the Silk Road Trip Itinerary) for providing such detailed information about all of the places we traveled to for us while we were on the trip and for this blog so that I could best share my tales with everyone back at home. I hope you all enjoyed reading about the Silk Road excursion. 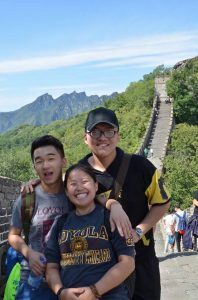 I apologize for my rambling near the end there, but I definitely enjoyed reflecting back on the trip and locking those beautiful memories away in my heart. I’m glad that I pushed myself and took the time to write about it. I won’t ever stop talking about it, even well after I’ve returned to America. Because of the trip and because of the people on the trip, I’ve grown and developed yet again, and I can never express enough thanks for that. Hello, hello, again! 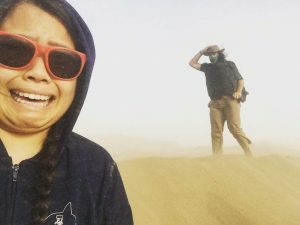 I’ve been itching to post about our time in the desert town of Dunhuang for awhile because of camels and a sandstorm. Some good news, our third overnight train to Dunhuang was a huge improvement from our train to Lanzhou. “I’m so glad this train ride isn’t as bad as last time,” was a common phrase that night. I noticed that the landscape outside quickly changed from common greenery like trees and grass to sand for as far as the eye can see. Dunhuang is a desert city that once was the last stop on the Silk Road before the route split off to the north and the south around the Taklamakan Desert. It served as an oasis for travelers before they journeyed into the harsh environment of the desert. 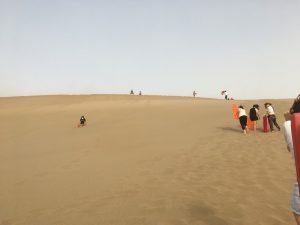 The air in Dunhuang, and in the next two cities that we would visit in the west, was way drier, and one could notice the many signs that said “please save water!” in all of these towns. 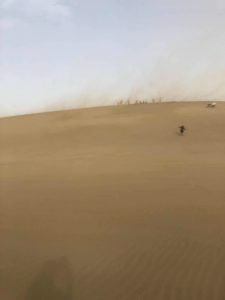 It was also hard to not notice the giant sand dunes in the distance, like mountains, and since it was particularly windy that first day in Dunhuang, you could see the clouds of sand being blown off the top of them. Seeing sand dunes in the horizon half of the time I looked around was bewildering. I’m used to seeing the concrete jungle of Chicago, and I’ve only seen sand dunes a handful of times on a beach. It was something else to see sand dunes constantly looming over the horizon. 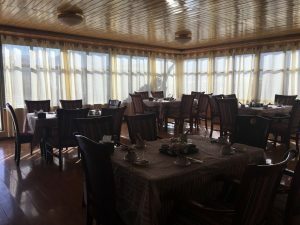 Upon our arrival to Dunhuang, we hopped onto a bus and had breakfast at a hotel. The breakfast lounge had an outside patio where you could enjoy your breakfast while gazing out into the dunes in the horizon. Our view during breakfast. Look at them sand dunes! 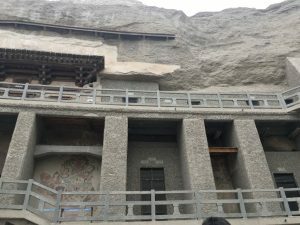 After breakfast, we took a bus to visit the breath-taking and ancient Mogao Caves. 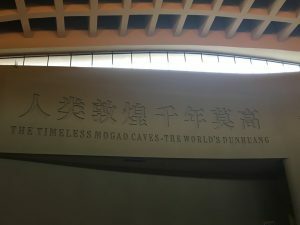 The Mogao Caves, also known as the Caves of the Thousand Buddhas, are the world’s largest collection of grotto Buddhist caves, filled with many relics and statues. Dunhuang had been a great centre of Buddhism, and after the founding of the Mogao Caves, the town was a major place of pilgrimage. The caves have Buddhist murals that are beautifully intricate and detailed, even though the paint has faded over the thousands of years. The oldest cave is from the 4th century! How could these caves stay so well preserved, you ask? It’s mostly because the location of these caves was so isolated that they stayed untouched after the caves were abandoned. They only resurfaced thanks to an explorer, Sir Aurel Stein, who stumbled upon the caves and discovered the “library cave,” which had an insanely rich collection of 60,000 paper manuscripts, documents, and more, the oldest of which dating from the 5th century. As a result of the age of the caves as well as the significance of these caves, we were not allowed to take pictures inside of the caves in order to prolong the further preservation of these murals. The doors pictured led to the inside of each cave. We only saw a handful of caves, and every single one of them had paintings that I could only imagine how they looked like when they were fresh. We even saw a gigantic Buddha statue that was carved into cliff, a Buddha so big that you had to strain your neck to look up in order to see the entire statue. 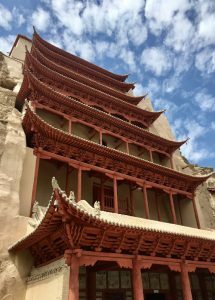 A beautiful snapshot I got of this iconic structure at the Mogao Caves. Once we our tour of some of the caves ended, we checked into our hotel and were given a free afternoon to eat lunch and pack our overnight bag. The plan was that we would go to a camping site out to the edge of the desert on a bus, and then we would spend the night there in tents. The hotel that we checked into would just serve as a place to store our bags and to wash up after our time in the desert. Many of us excitedly talked amongst ourselves about our upcoming activities during our free time. Camping in the desert would be a once-in-a-lifetime experience for all of us! Getting to the campsite, though, was an experience in on itself. The original intention was that our bus driver would drop us off at the gate entrance to the campsite and then we would walk in. The gate entrance was separated from the main road by a tiny, tiny, metal bridge. When I say tiny, I mean we all thought that there was no way a bus could fit on it, let alone drive across it. But our bus driver decided that he would drive our bus across this tiny bridge and then past the gate entrance. He drove us across a TINY bridge that was just barely the width of the bus just so we wouldn’t have to walk as far! It’s obvious when I say that we were mad stressed when he slowly inched the bus across the bridge, and we shouted whenever we hit bumps. But, somehow, we got across that bridge and were driven further in. Getting off of the bus, we were greeted by the campsite’s owners. The campsite had a small metal building that had a tall roof coming off and over the side of it to provide shelter. There were benches and tables arranged around the side of the building, and we set our stuff down here. The wind, which had been blowing pretty hard all day, had picked up even more, and sand was whipping around everywhere. This picture perfectly captures the sand billowing off of the top of those dunes. That didn’t stop any of us from kicking off our shoes and running out into the sand, dragging plastic sleds that the owners provided to us. Trudging up the sand dune! Some people chose to stay down on ground-level to avoid the whipping sand at the top of the sand dune. Those people were smart. Made it to the top!!! The wind was absolutely terrible at the top of the dunes. 0/10 would not recommend, but it was pretty worth it! 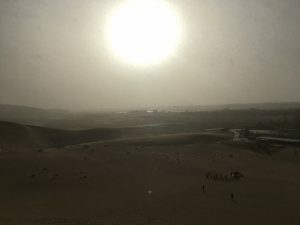 At the top of the dune, those of us brave enough to endure the sandstorm enjoyed the breathtaking view as we took careful hard breaths from the climb up. The sun was bright, and the horizon was just blurred out from all of the sand. The view at the top of the dunes. I somehow managed to still take pictures at the top. Sliding down the dune on those plastic sleds was another story. For those who haven’t been sledding before, you basically sit on a piece of hard plastic, scoot forward a little bit, and hope to gosh that you don’t wipe out as you speed down the hill. I managed to somehow slide down the dune without wiping out, but some of my other peers weren’t so lucky. Good thing that sand is relatively soft! Once we had our fun in the sand, we trudged back underneath the safety of the roofed benched area. That is where we got some unfortunate news: because of the winds, camping out in the desert would be unsafe, lest one our tents with students in it gets carried off somewhere. Our plan was thus changed: we would get up at 5am the next morning in an attempt to ride the camels in the desert, weather permitting. We were disappointed, but we shrugged off the bad news quite easily. Me personally, I was glad to have experienced the desert sands (even if it was in the context of a literal sandstorm) and share some laughs with my fellow TBC peers. 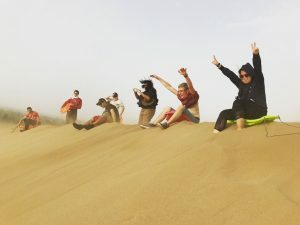 I was just really happy to be a part of a group that would fearlessly try to conquer a sandstorm, regardless of how much sand we got in our clothes, and would carry a positive attitude regardless of the outcome. So, with our pockets full with sand, we hopped back onto the bus. At our hotel, we dumped sand out from our clothes, and spent the night at our hotel instead. 5am the next day, we all sleepily dragged ourselves out of bed and downstairs in our hotel lobby, bundled up for the cold weather out in the desert. We hoped that the weather that wasn’t as bad as the day before, just so we could at least ride the camels. Most of us, between camping and riding the camels, looked forward to the camel riding to see the sunrise the most. To our delight, the wind was basically gone, and the weather was determined safe for us and the camels to be outside. The moon was still out that early in the morning, and it was full and shone very brightly. 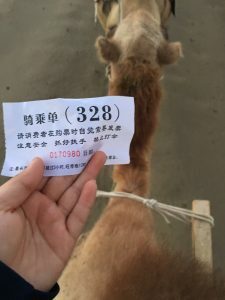 When we got to the location that offered camel rides into the desert, we were given tickets with a number on it. The number we were given matched with a number on a camel, and that camel would be the one we would ride. We were then divided into groups of five, and my group was lead to our camels. When we got to the place where all the camels patiently sat waiting, I was taken aback just at how many camels there were. 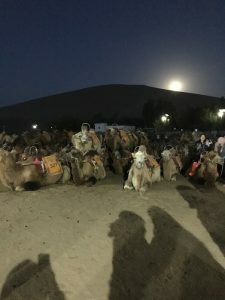 I didn’t know what I was thinking, but I didn’t think that there were going to be that many camels all sitting there in the dark! I hauled myself in-between the two humps of my camel where there was a saddle, gripping onto a metal bar in front of me. At the command of the camel leader, the camels got up onto their feet, and they followed him in a single file line on a specific route that would take us to yet another breath-taking scenery on this trip. 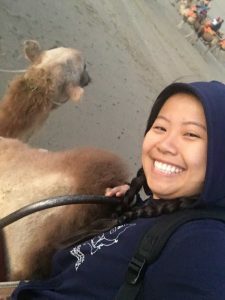 Riding a camel is very similar to riding a horse, except there’s a more pronounce “sway” from side to side. There’s a kind of rhythm to it, and you just have to go with the flow or else you felt like you could fall off at any moment. On our way to watch the beautiful sunrise! Perched on our camels and definitely awake at this point, we gazed around in awe as the morning sky turned from a dark navy blue to a light blue to a faint orange and right of the sunrise. 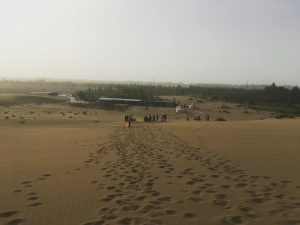 The sand dunes were just as majestic as the mountains of Xia’he, if not more prettier because of the foreign landscape. After awhile, the camel leader stopped and told the camels to lay back down (a process that’s pretty jarring, since it’s a sudden drop in height when the camel lays back down on its legs). 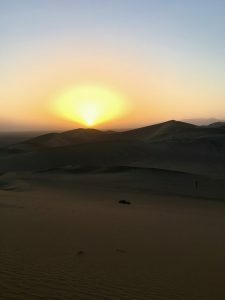 We got off of our camels and trudged up a sand dune to watch the sunrise at the top and to take loads of pictures. That morning sunrise is probably one of the most beautiful I’ve ever seen. The sun was a distinct orange color, and the shadows of the sand dunes cast a mysterious feeling inside of me. The sun peeking out over the sand dunes. Our camel leaders ushered us back onto our camels after the sun climbed high in the sky, and we rode back down and then to Crescent Lake. On our way to Crescent Lake with the early morning sun bathing us. Crescent Lake is a precious source of water for thousands of years in Dunhuang. 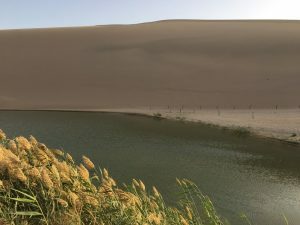 It is a small, and getting smaller, lake which lies just next to the towering sand dunes. Without this lake, it is debatable how human life could have survived in Dunhuang. Once our time was up, we hopped onto a shuttle that took us back to the parking lot where our bus was. 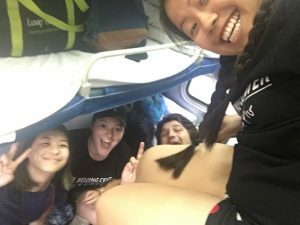 After all, we had to hurry and pack our bags to hop onto… you guessed it, another overnight train to get to our next destination, Turpan! 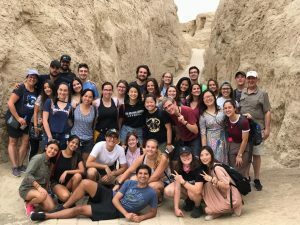 That’s it for our time in Dunhuang! 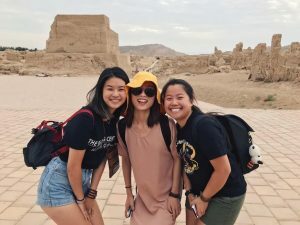 Come back next time to hear about our explorations of some ancient city ruins in Turpan! Welcome back to the Silk Road, everyone! 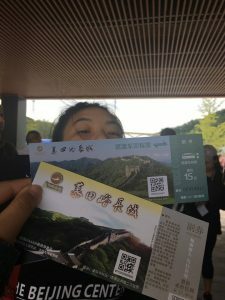 In my last blog about our amazing excursion, I described our adventures in the ancient capital city of Xi’an, where I had a personal encounter with the Terracotta Warriors and some mouth-watering yummy crispy meat buns. 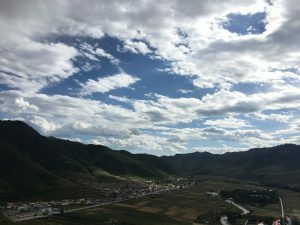 Now, let’s dive back in with the second destination of our trip: Xia’he, a Tibetan monastery town tucked away in a mountain valley at the edge of the Tibetan plateau. 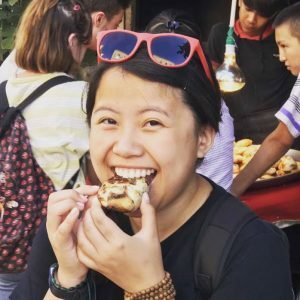 If I had to choose a favorite out of all of the places we went to, I would choose Xia’he, and I’m about to tell you why. So, our second overnight train ride was a little rough. We got on the train to Lanzhou around 11pm after spending our second day in Xi’an, exhausted from our day activities. Actually, we had to tip-toe onto our train since most people on the train were sound asleep. We all were spread out amongst three different train carts instead of being in one cart. Granted, this train ride had only been about 9 hours and was during the late night hours (a.k.a. prime recharge-your-battery hours), but it was harder to sleep soundly since most of us were surrounded by strangers. Nevertheless, most of us managed to tuck ourselves away into bed and get some rest. We arrived in Lanzhou the following morning around 8am and were met by our next local tour guide, Peter. Peter was a very kind and soft-spoken man. He was very knowledgeable about both Lanzhou and Xia’he, and he taught us many things about Tibetan culture as well as Buddhism. I fondly remember Peter running off of our bus multiple times to buy us all packs of water, and I remember him joking around with us students throughout the time we spent with him as our tour guide. Many of us consider him to be one of our favorite tour guides on the trip because of his calm demeanor and easy-going attitude. Lanzhou was, for centuries, a major stop on the Silk Road because it was essentially a crossroads in the route: the southwest had Xia’he and the northwest had the desert landscapes of Dunhuang and Jiayuguan. 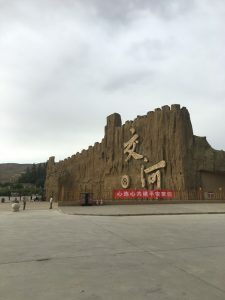 The fact that Lanzhou literally had the Yellow River flowing through it made it a perfect rest stop for weary travelers. We didn’t stay in Lanzhou for long, however: we only briefly stopped in town for breakfast. On the menu was Lanzhou’s famous hand-pulled beef noodles. 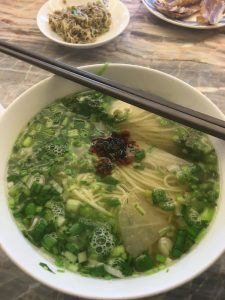 The broth was rich and the noodles were delectably chewy, and we were able to customize what we wanted to put into our soup, like a choice of various slices of meats and veggies. Noodles for breakfast gave all of us some much needed fuel after that rough overnight train ride. Once we finished our breakfast, we hopped onto our bus for the 4 hour ride up into the mountains to get to Xia’he. I don’t remember much of that 4 hour bus ride since I slept most of the time (I personally had not gotten much rest on that overnight train). But when I did wake up, I was met by bewildering and majestic sights: mountains and valleys covered by various greenery and kissed by beautiful blue skies that were dotted by fluffy white clouds. It was like the weather was welcoming us as we drew closer to our destination. A view from my bus window. Beautiful valleys outside my window. Blue skies and fluffy clouds at a pit stop. Finally, after 4 hours, we arrived in Xia’he. The city, in comparison, was much cooler than Xi’an because of its elevated location in the mountains. I believe Peter said that the city was perched at around 8,000 feet above sea level. 8,000 feet above sea level. The air wasn’t noticeably thinner unless you were exercising (later on, we would hike even higher up into the mountains to get to the sky burial site, and all of us definitely noticed the missing oxygen in the air). But we were warned to not strain ourselves while in Xia’he as a precaution against altitude sickness. Xi’an was consistently in the high 80s and even 90s, but Xia’he’s temperature hung out around the low 70s. Most of us were thriving in long pants and jackets and sweaters. The air was noticeably more cleaner, more fresher, and somehow, more crisper. Well, it was when we got away from the area around our hotel since Xia’he’s streets were underneath construction during our visit. 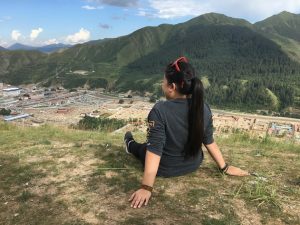 The people also preferred to speak Tibetan than Mandarin (remember, Xia’he is on the edge of the Tibetan plateau), and it was one of the first times where those of us who spoke some Mandarin ran into situations where they could not directly communicate with the locals. 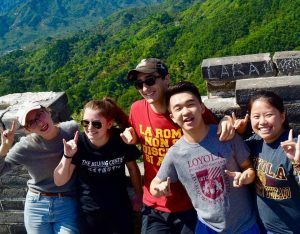 Luckily for us, most people were able to understand and speak some Mandarin, and hand gestures and smiles are part of the universal language. To welcome us to their hotel, the hotel owners draped a long white silk scarf, called a “khata,” around each of our necks, generous gifts of hospitality. 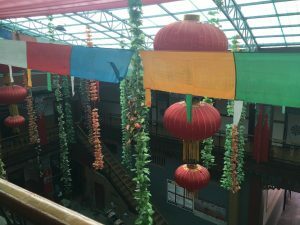 The hotel was very colorful, with large lanterns and leaf-covered “vines” hanging down from the ceiling and the walls and pillars were decorated with Buddhist motifs and flowers. There were even Buddhist prayer flags hung up almost everywhere. The doors to our hotel rooms were covered by a thin colorful curtain that you had to part in order to get to your actual door. It was very whimsical, and because of that, I think that hotel was my favorite. It had a really warm sense of hospitality and because its interiors were just so fun to look at. After checking in, we were given free time to rest up in our rooms before we got back onto our bus to go to a Tibetan-style dinner out on the Tibetan plains. A beautiful view of the decorations in our Xia’he hotel. Picture taken on the second floor, over the balcony. On our way there, Peter explained that to greet us, our dinner hosts would offer us a small glass of Tibetan wine, made from barley. He said that the correct way to accept the wine was to dip a finger into the wine and then flick the finger away from you, repeating this for a total of three times. These three gestures symbolized heaven, Buddha, and people. Only after you did this, you could drink it. If you didn’t do this, it would be considered impolite. And sure enough, when we got off of the bus at the site, there was a man who cheered for our arrival and offered tray with shot-glass sized silver cups filled with what I figured was the wine. I remember asking Peter if we were supposed to drink it all in one go, to which he said yes, so I drank the entire thing in one go. I remember the Tibetan wine being very strong yet smooth, and it warmed my belly up quite pleasantly. Both Peter and the man who gave us the wine were very impressed by my ability to drink it all. It’s safe to say that we all loosened up a little after drinking that small shot of Tibetan wine. Walking onto the site, we noticed a lot of colorful tents and fluttering prayer flags everywhere. Somewhere around the middle of the site was a tall pole with even more prayer flags. 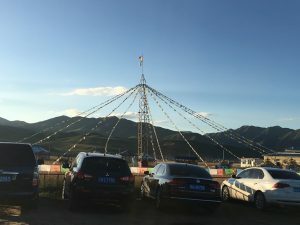 There were other tourists visiting the area, some trying on vibrant traditional Tibetan clothes to take pictures with, others just taking pictures out in the grass plain with the mountains and the setting sun in the background. Our group was lead inside probably the largest tent, where there were many round tables scattered around with a stage that had the Tibetan grassland horizon as a backdrop at the front. After seating ourselves, we were served various dishes with Tibetan noodles, meats, and veggies, and we enjoyed each other’s company, joking around and laughing away the day spent mostly traveling. Once we had finished our meal, our hosts entertained us with a traditional Tibetan Guozhuang dance and some Tibetan singing as well. All of those little flag-like cloths are actually prayer flags. 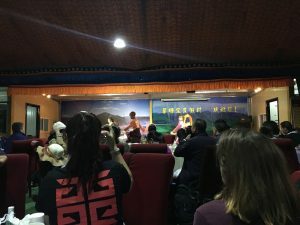 Once we had finished our meal, our hosts entertained us with a traditional Tibetan Guozhuang dance and some Tibetan singing. After the performance on the stage, we were invited outside into the cold night, where the bright full moon greeted us. Our hosts lit up a warm bonfire, and just when we all gathered around it to warm ourselves up, they put on some loud dance music on speakers. 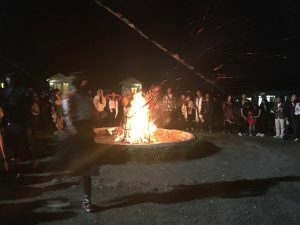 All of the guests were encouraged to dance around the bonfire and enjoy themselves. My friends and I jumped right in, joining the circle of people holding hands and just dancing however they saw fit. Fireworks lit up the sky as we laughed and danced together and with other tourists who were there.. The fireworks were bigger than any fireworks I’ve seen in the U.S. — in fact, they were so big and seemingly close to the ground that my friends and I got a little worried! We sang and danced around this bonfire for what felt like hours. Eventually, our trip leaders ushered us back to the bus. We were still hyped up from our enjoyable time at the Tibetan dinner, as shown by our chattering on the way back to the hotel even though it was around 10pm. That was when Peter came up to the front of the bus and sang us a love song in Chinese. His voice was just as soft and soothing as his regular voice, and we all broke into applause when he finished. Then, he told us that since he sang a song for us, we should sing a song for him. Hilarity ensued as some of us walked all the way up to the front of the bus and took turns singing all different kinds of songs. We have some Columbian students on the program, so some of them sang some Spanish songs. Someone came up and sang a High School Musical song, and you know that we all joined in on that! 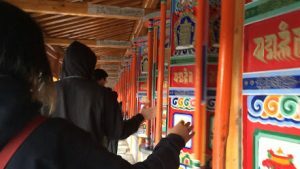 Once we got back to the hotel, in the darkness of the hotel lobby, before we retired to our rooms, a group of us, half-asleep and tired from the day, planned to go circle the 1.5 mile long Labrang Monastery wall and spin the Buddhist prayer wheels early in the morning. It was a rather smaller group, about maybe 6 or 7 of us. Little did I know that I would come out of that morning with an experience that I now hold precious to me. I woke up around 5:30am and quietly put on layers of clothing to protect myself from the cold morning. As I got ready, I remember thinking that I didn’t know exactly what I was getting into, but I knew that I just wanted to experience it. I knew that I wouldn’t get another chance like this again, so I figured I would sacrifice some precious hours of sleep to go experience this morning hike. 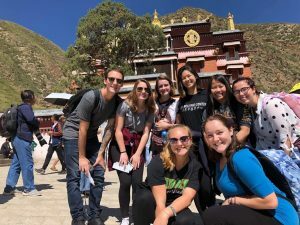 I met the other students downstairs in the lobby, and then we headed out into the cold early morning to the Labrang monastery, a very important Tibetan-style Buddhist temple grounds to the Tibetan people. Many people make pilgrimages to this temple to pray at it. We walked over to the Labrang monastery, which was a short distance away from our hotel. We were unsure what we were supposed to be doing for this hike. Most of the information we were given about this optional activity was pretty minimal (in the Travel Bible, it only said “Suggestion: Early morning walk to the Labrang Monastery to join the local pilgrimage by circling the 1.5 mile long Monastery wall and turning the thousand of prayer wheel”), so we decided to rely on watching what the locals did. We followed as some locals walked up to what I figured was that 1.5-mile long wall, which was covered with endless amounts of prayer wheels, and started to spin each of them as they walked past them. Let me explain what prayer wheels are, since I’ve thrown the word around a couple of times now without saying what they were. 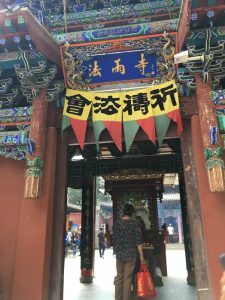 They are vertical wooden structures that have very colorful Buddhist motif paintings on them, and inside of them are prayers written on a scroll of paper. The belief is when these wheels are spun, the prayers inside of those wheels are “spoken” and then carried off into the wind. We continued to walk, and walk, along the wall of the monastery, all the while spinning those wheels. Some of them were visibly worn from all of the years they’ve been spun, with their vibrant red paint fading where the people pushed them. As they spun, they made a soft creaking noise. At first, we giggled at how some of our arms were getting tired pushing the wheels so that they would continue to spin. The wheels were surprisingly heavy to push! But after awhile, we fell silent, taking in the experience. What happened next was something that I’ll never forget. We continued to walk, and walk, along the wall of the monastery, all the while spinning those wheels. I come from a Buddhist family, and so I figured I would pray as we spun the wheels. At the time when I initially decided to pray, I didn’t think much of it. I had prayed before at temples back at home, and I figured that it would just be something nice to do My prayers were silent and internal, so no one really knew I was praying during our walk. But when I was praying, I started to feel something stir within me. It’s really, really difficult for me to find the right words to describe the sensation in a way that would make sense, and I apologize ahead of time if it doesn’t. You know that feeling when you’re about to cry, but then you hold back your tears? That feeling that starts in your chest and spreads up to your eyes and your nose? What I felt was only similar to that feeling. I didn’t feel like I wanted to cry, nor did I feel like I was going to cry, but I became emotional, to say the least. Maybe I did feel like I was going to cry, but it feels a little weird to label it as so. My chest just tightened momentarily, and my gut felt strange. Walking against the walls of the monastery while spinning those worn, yet colorful and vibrant, prayer wheels, suddenly became something… magical. Something incredible. 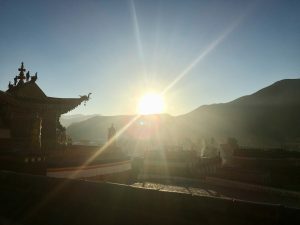 As the cold morning air blew while we pushed the prayer wheels to spin, I really did feel like… like my prayers were being heard carried off into the heavens by the wind. Because I had prayed for some personal things, feeling that way meant a lot to me. In that morning, something stirred within me. Walking along the trail in the mountains, with the monastery walls to the right. Looking back on it, as I write this blog, “amazing” doesn’t wrap up the experience neatly. It doesn’t describe the experience in its entirety. It doesn’t describe the awe I felt when watching Tibetan Buddhists dutifully walking along the trail chanting and praying underneath their breaths while I huffed and puffed to keep up. It doesn’t describe the… the “spiritual intenseness” of my emotions as I prayed for personal and intimate things in my life. Before that morning, I had never thought that I was spiritual. 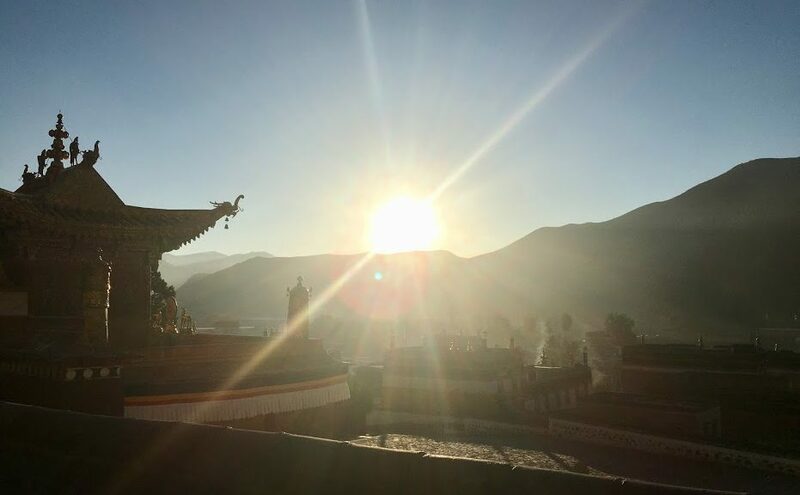 I never thought that, after walking alongside my fellow students and the locals on the trail around the Labrang monastery, spinning thousands upon thousands of prayer wheels, I would hold those memories, those views, those feelings, dear. But ever since that morning, I’ve grown spiritually, and our visit to Xia’he became a lot more personal than I thought it would be. We ended our morning walk once we stumbled upon the same area we had started at about 2 hours earlier. I felt strangely energized even though I was sleep deprived and a little tired from the long walk. I came back to my hotel room and instantly messaged my family and some of my friends back home to tell them what I went through. I had to tell my roommate for the Silk Road what I had experienced. My heart felt fuller, and I felt more calmer. A sense of peacefulness and reassurance filled me. These words that you’re reading on your screens can’t just describe the feeling of that morning well enough. At around 8:30am, we had breakfast at the hotel. Breakfast consisted of delicious bread, a yogurt that tasted very similar to Greek yogurt, only more thicker and more sour, and a sweet jam, served with tea. Servers even brought us some fried eggs. I discovered a delicious way to incorporate all parts of the breakfast: I spread the yogurt on a slice of bread first before adding a layer of jam, and then I put my fried egg on top before prompting shoving it into my mouth. I think the breakfast at the Xia’he hotel was my favorite breakfast as well. After breakfast, we all walked to the main area of the Labrang Monastery, led by Peter. There, we had a guided tour of the monastery by a monk, who spoke very good English and was very eager to talk to us tourists. He led us into certain rooms of the temple and explained the statues inside as well as the decorations inside. We were forbidden to take photos, since it’s considered to be disrespectful, so I unfortunately cannot show you what we saw inside the monastery buildings, but the statues were impressive statues of different Buddhas, and the decorations were usually original paintings. While he gave us a tour of the monastery, the monk casually gave us some Buddhist teachings. This is where I became emotional all over again, which, again, I didn’t expect at all. I’m not so sure what it was about what he told us, but his teachings were so similar to the lessons that I’ve learned from my parents and to the morals that I hold myself to that it just resonated with me. It would be safe to say that homesickness and a yearning for home almost washed over me as I listened to this monks’ teachings. With his smiles and his agreeing grunts, I felt that he really did give us a taste of Xia’he’s Buddhism. One of the buildings within the walls of the Labrang monastery. I’ll leave my favorite quote from the monk here for you to digest yourself. Once we finished our tour of the Labrang Monastery around 12pm, we were given free time for lunch. During the free time, my friends and I wandered around looking at many different prayer beads being sold on the side of the road and in various tourist shops. After awhile of looking, I finally bought my own prayer beads to wear around my wrist to symbolize the personal and spiritual moments I had in Xia’he. I wear these prayer beads almost all the time, now. But our day wasn’t over yet. I know, it was only 12pm and I had already done so much! After we got lunch, we took a bus to visit the nunnery. The bus only took us to another part of town before we got off and hiked after Peter further up a path that winded through the town to get to the nunnery. There, Peter gave us a detailed tour of the inside of the nunnery’s prayer hall, explaining the different paintings on the walls and the symbolism behind them (again, we were not allowed to take any photos inside — sorry guys!). I remember being really fascinated by Peter’s teachings, comparing them with what I already knew about Buddhist motifs and symbols. The view outside the nunnery. You can see Xia’he in the distance. 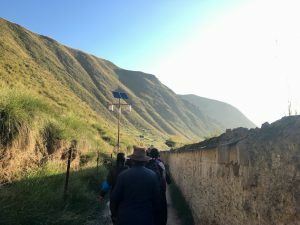 Once Peter was done giving us our tour of the nunnery, we were given an option: we could either hike back down the path to the bus and go back to the hotel, or we could make the trek up to the Sky Burial site, which was located way up further into the mountains. Of course, you know that I chose to do the hike up to this site in the mountains. Sky burial is an ancient Buddhist-Tibetan burial tradition. Buddhists believe that the body is only a vessel to the soul, and once the soul leaves the body, it is no longer of use. As a result, bodies of the deceased are offered to vultures, who are revered and seen as a manifestation of a flesh-eating god, as a final act of generosity to the living world and provides a link in the cycle of life. Practically speaking, the practice is ecologically friendly and is a sound way to dispose of bodies in a scarce land. The hike to get to the site, if you went nice and slow, wasn’t all too bad. It was the thin air and the steep climbs at certain parts of the trail that got to me. Every so often, I made sure to stop and turn around to admire the increasingly incredible view behind us (and to take a ton of pictures). The city of Xia’he got smaller and smaller as we climbed higher and higher into the mountains. The blue skies speckled with white and grey clouds were just absolutely incredible to see. The weather was pleasantly cool, and the sun wasn’t shining down too harshly on us. That hike, as tiring as it was, was well worth the incredible views. 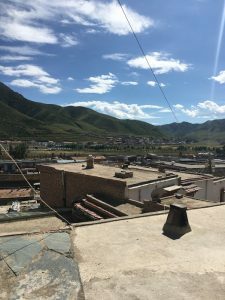 Once we got to the Sky Burial site, Peter graciously gave us some slips of paper, made to be thrown into the air as you made a wish on this little platform that looked over Xia’he. Each one of us took turns throwing our own stack of these little slips of paper into the air, cheering as we watched our wishes literally getting blown into the air by the wind. TBC up in the mountains! 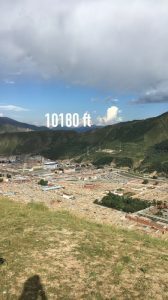 Once we were finished with our wishes at the Sky Burial site, we followed Peter even higher up into the mountains until we were over 10,000 feet above sea level (I know because I checked that elevation thing on Snapchat)! There, we took even more photos, including the cliche mid-air jumping photo. I’ll let our photos speak for themselves in terms of how gorgeous the views were. See, I told y’all we were 10,000 feet above sea level. Snapchat said so. When we were satisfied with the view and with our photos, we made the trek down, making sure we didn’t lose our footing. 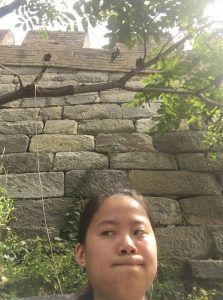 My friends and I in particular started to sing (more like shout) Disney songs, giggling and fooling around the entire way down. We warranted some amused looks from both Peter and some of the trip leaders who were tagging along our friend group. Once we came all the way down the mountain, we were released for dinner time on our own. My friends wandered around a little bit before we found a “fast food” restaurant, where the majority of us end up ordering this spicy fried chicken wrap. We were amused by a family sitting behind us with two rowdy children, who were equally if not more amused by our presence. At one point, the girls gave us some candy as thanks for entertaining them as their moms gossiped a little bit and got some free time to themselves. 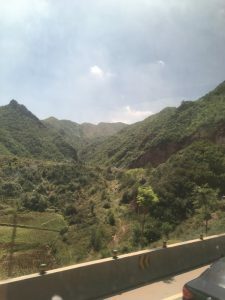 After spending our last night at Xia’he, we took another 4 hour bus ride all the way back to Lanzhou. 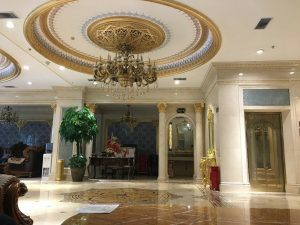 We stayed in Lanzhou for two nights and one day in a really fancy gilded-in-gold hotel. 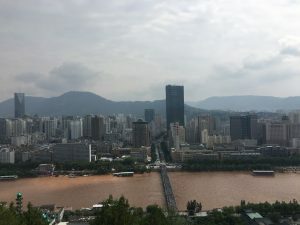 During our (much longer) time in the ancient “crossroads” city, we crossed the impressive bridge over the Yellow River and hiked to the hill-top temple that gave us a look over the city of Lanzhou. I know. More hiking. But trust me, every single time we had to do some sort of hike, it was always worth it. 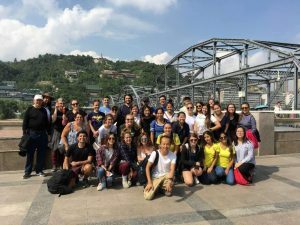 TBC next to the Yellow River and one of its bridges across. On our way up to the hill-top temple, my hiking group stumbled across another Buddhist temple, in the middle of its prayer chants. Hearing the familiar-sounding chants coming from behind the gates, I, with the reassurance of Peter, wandered in, my peers curiously following me in. The temple smelled of burning incense, and the prayers being chanted were loud and rhythmic. It reminded me of home, when I would sit in with my parents at temple during prayer chants. 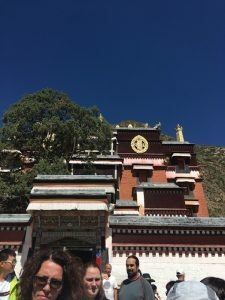 Naturally, a lot of my peers asked me questions about the practice of Buddhism, and I was glad to share my cultural and religious upbringing with them. Peter even bought us giant incense sticks for us all to burn. 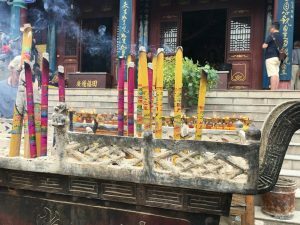 I taught everyone who wasn’t familiar with the practice of praying with incense how to do so, and by the end of it, we had contributed our own prayers and our own incense sticks to the many already burning to the chorus of chanting inside the temple. 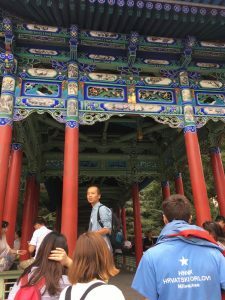 At the very top, there was another temple-like structure which acted like more like a tourist shop that sold prayer beads and jade jewelry. I spent most of my time on the balcony, enjoying the horizon of Lanzhou and bathing in the bright sunlight. The city of Lanzhou and the Yellow River. 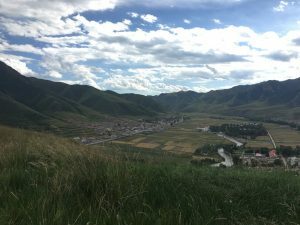 Our time in Lanzhou was really fun, but I’m quite biased. That one day in Xia’he was one of the best days for me on the trip. Not only did it allow for me to explore myself spiritually, it gave me several experiences that I continue to reflect upon now. 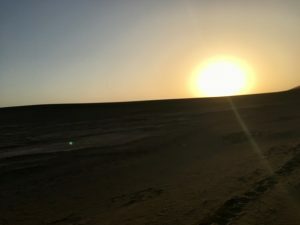 The next day, with my prayer beads wrapped snug around my wrist and my heart feeling a little fuller than it did before we came to Xia’he, we departed on our third overnight train of the trip to the deserts to the west. That’s about it in Xia’he and Lanzhou! I hope you all enjoyed my tales. 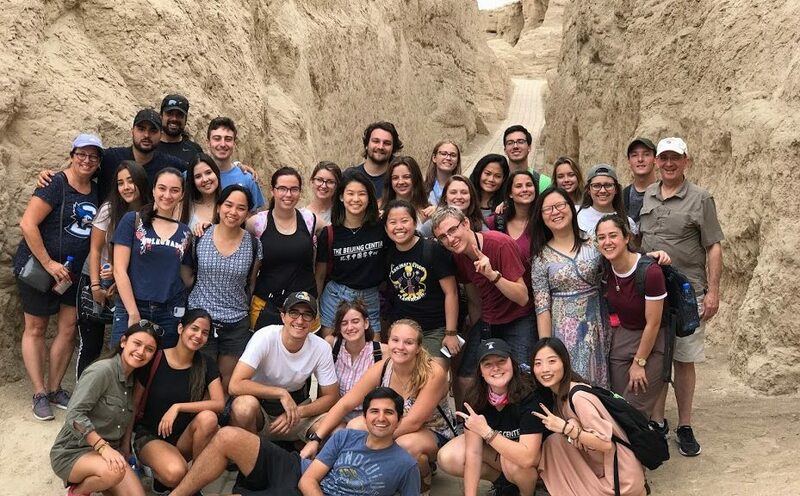 Come back to hear all about our sandy times in Dunhuang! After a few train rides, some fun cabs, and a random boat trip, I was able to pack three cities into my first weekend out of Rome. Running on about 4 hours of sleep, a few friends and I took a cab to the train station. Pretty neat experience with a driver who sang Mama Mia to us. We took a train down to Salerno, Italy, where we were going to catch a bus to the Amalfi coast. If you have ever been to Europe, you know that the bus system isn’t always very reliable. We waited an hour for this bus, and when it finally showed up, IT DROVE RIGHT PAST US!! 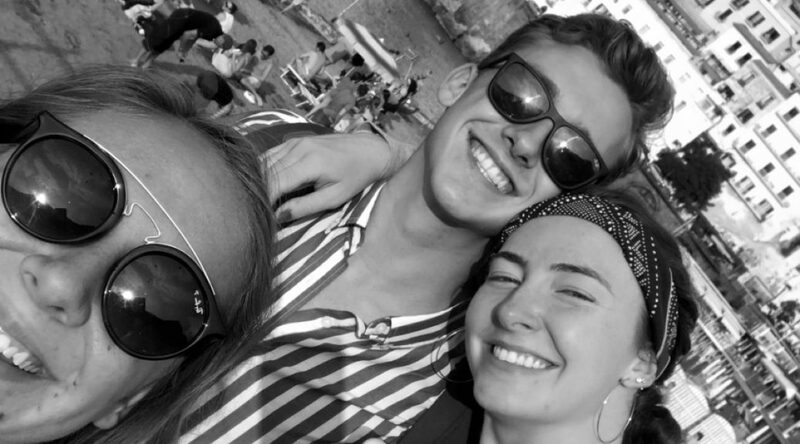 We made friends with some other American’s who were on their honeymoon, also trying to get to Amalfi, and they invited us to catch a cab with them to take a ferry instead. We had no other options so we decided to tag along. It’s about 1:00 and we are on a boat sailing along the coast and it was the most beautiful site ever. The buildings of the small cities are so simple and colorful, and the ocean was so blue. Our plans didn’t go exactly how we thought, but I’m glad we didn’t have control over them. We layed out on the beach of Amalfi for a few hours with a bottle of champagne and it was the perfect way to spend my afternoon. Highly recommend Amalfi to EVERYONE! It is amazing. Later that night we head back to Salerno where we take a train to Pompei, where we have a hostel. We woke up early the next day to check out the ruins which were so cool. If you haven’t been, the city of Pompei was buried by lava and was dug up. The city was huge and so interesting to get a glimpse of how they lived back then. Afterward, we took another train to Napoli, where we checked into another hostel and went out to explore the town a little. This is where I had the BEST cheese and ham appetizer I have ever had and probably will ever have. Everywhere I have been in Italy, the thing that always catches my eye are the streets. Black cobblestone, no street signs, people driving in cars and mopeds honking everywhere. And the sunlight reflecting off of the buildings is so pretty. Later we came back to the dinner that the hostel provided. Homemade, Italian style pasta, and let me tell you, pasta here is soooo much better than America! The next day we walked through the town of Napoli and made it to the coastline where we walked to a castle and looked at the amazing view of the city from about 100 yards out in the ocean. The view was breathtaking, to say the least. And we couldn’t stop in Napoli and not get pizza, so that’s just what we did. Walked a little further down the coast and stopped at a random place and had some of the best pizza I’ve ever had. After our time there we made our way back to Rome. Pretty successful weekend. After a week of classes, some exams, and seeing the Pope on Wednesday, I’ll be exploring Florence! Theoretically, packing for four months seems achievable. Now that I’m actually here, I realize that I am missing quite a bit of the things I couldn’t manage to fit into my suitcase. No, a large suitcase and carry on plus a backpack with a 50 pound weight limit do not cover it all! I guess I’ll think of it as an excuse to buy things here in Italy or wherever I might travel to! Funny enough, my roommate and I found ourselves at H&M down at the city center…very cultural of us. The flight itself was decent. I tried sleeping, but I ended up playing trivia games with my roommate instead. When we arrived, the Zone Hotel told us our rooms weren’t ready yet. Jet-lagged, we hobbled over to the restaurant eno-z for a BIG glass of water. End of the story? We showered and napped before walking back to JFRC later that night for dinner. Let me just say that although interesting, orientation here reminded me of freshman orientation…except much cooler! The days were extremely long ranging from 9AM-9PM, sometimes longer. That doesn’t include the time it takes to get ready and walk over in the morning from the Zone nor does it include the outings at night that we went on in our own time. Moral of this story? Sleep is for the weak, but also for the smart! Nevertheless, it was fun. Lions and Tigers and Gladiators, Oh My! On the first Saturday, we went in groups to see the Colosseum and Roman Forum. Prior to the trip, Dr. Sander Evers gave an engaging presentation about the history of Rome, beginning with the classic story of Romulus and Remus. Once at the Colosseum, I think the background information helped me appreciate the site more, yet it wasn’t as exciting since it was my second time visiting. At least I was able to make new friends out of the experience! As the last day to our week long orientation, the SLAs (Student Life Assistants) took us on a grandiose trip to the beach. 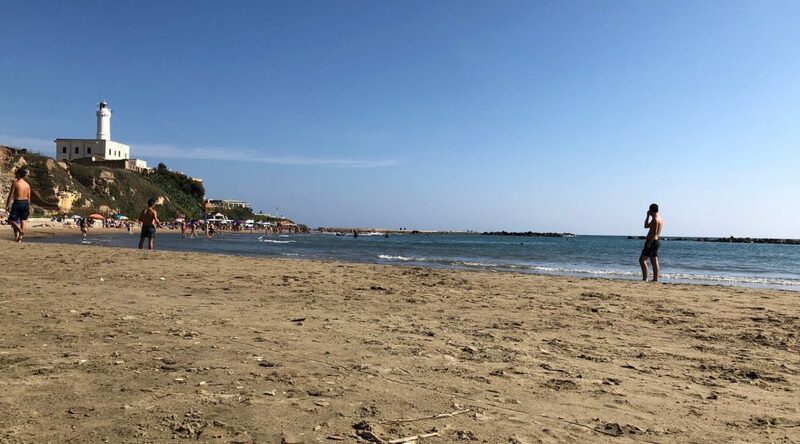 From what I remember, it was called Rambla in Fiumicino. We each got our own lounge chair, which was nice because I don’t think I would’ve wanted to sit in the sand all day. You would think that after 7 hours in the sun and no sunscreen, I’d be burnt to a crisp. Somehow that wasn’t the case! While the weather was partly cloudy, it was still hot and perfect swimming weather. The waves were enormous, and it was a real swim to get to the sand bar because the waves would cap over in the stretch before it. Don’t worry, I made it! I cannot believe the amount of salt water I swallowed. I lost my voice for the next two days! After swimming for quite a bit, I sunk into my lounge chair, exhausted and an Aperol spritz in hand. What a day that was! Classes started on Monday, Labor day. I love my schedule, and I better! It will be the easiest semester in my 4 years at Loyola considering I’m a Biology Major with a Molecular Biology Emphasis on the Pre-Med track. I think my favorite class so far has been Writing Fiction in Rome. It’s not that I’m a great writer or even great at English. It’s a class where I can be creative and not dread doing my homework all the time. It’s also partially on-site. I think Applied Piano comes close in second! My other classes aren’t bad either. Italian is actually useful because a lot of it is conversational and things I would use going out into the city center. Honors, not that it was really a choice, has been quite philosophical and beyond my mind so far…But at some point we will reach the topic of World War II, and I find that topic fascinating. I had my first Cell Bio class last night, and it was the smallest class I have here! There’s only 6 of us! I think it will be an interesting class, but I hope I don’t fall asleep since it’s from 7PM-9:30PM! I think I’ve underestimated my classes a bit. I wasn’t expecting as much homework as I’ve been getting from all my professors. I need to invest in superb time management!! As a final cap to our welcoming in Italy, the SLAs took us to Umbria for a weekend. It was an intense schedule for 3 straight days, but overall, it was worth it! 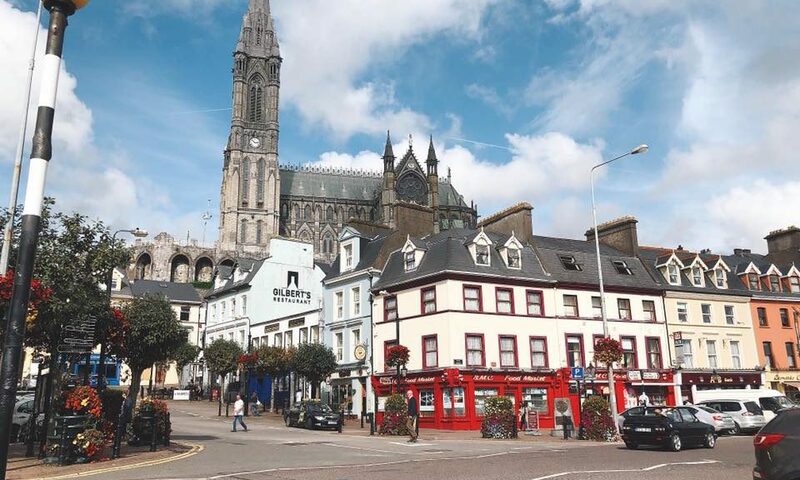 We visited new towns and captured new sceneries on our phones. From the Narni Underground to the streets of Spoleto, I thought it was intriguing and again, I met so many people! I do, however, think I will be avoiding pork, potatoes, and pasta for a few days. As much as this post has been a pleasure, it’s time for me to finally get some sleep! The next you’ll hear from me will be after my trip to Venice and Milan! I’m so excited! 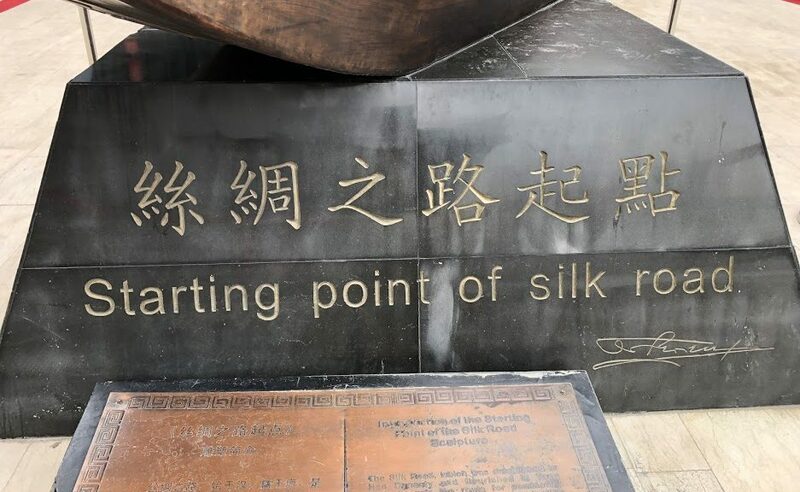 Since around the time of the Han Dynasty (about 200 BCE), the Silk Road connected the East and the West, facilitating the exchange of countless items as well as ideas between cultures. Travelers from both sides of the world used this route in order to get their hands on exotic goods, such as spices and, of course, silk. A map of the ancient Silk Road. 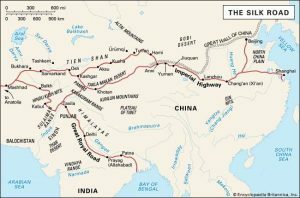 Our route took us from the East in Beijing ended in Kashgar in the West. We traveled along this same Silk Road. 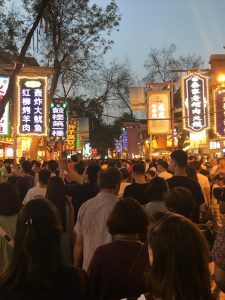 The journey took us over 2,000 miles west, and along the way, we experienced quite a different China, a China that was significantly more diverse, rich, and complex than I had originally thought. It’s difficult to put the awe and wonder that I felt throughout the trip into comprehensible words. Even as I write this blog, I have to pause every once in awhile to look at the pictures I took and find the right words to describe it all. This is where the phrase “you had to have been there” had to have come from. There was a presence that I felt at some of these historical, and even local, sites that cannot be neatly wrapped up with a bow. The trip left, for lack of a better, less cliche, word, an impact on me. 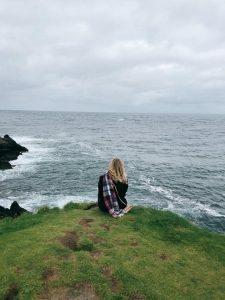 The memories that I created and the emotions that I felt were so personally beautiful that I’ve been itching to digest them for quite some time. And now, through these words, I can unpack my amazing experience and share it with you all. 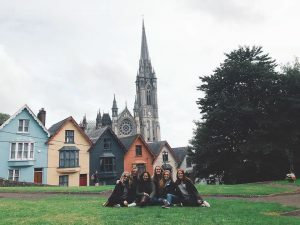 As a side note, I will be referencing our fondly nicknamed trip itinerary, the “Travel Bible,” which has amazing and detailed information about all of the locations that we visited, here and there, just to provide some background for you all. All in all, the Silk Road excursion lasted for two weeks. 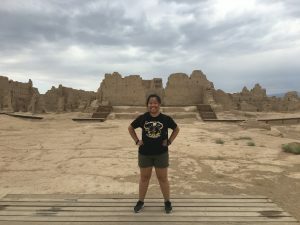 As a brief summary, we first wandered around within the city walls of Xi’an, hiked up mountains and enjoyed Tibetan culture in Xia’he, ate some delicious hand-pulled noodled in Lanzhou, got caught in sandstorms and took selfies with camels in Dunhuang, explored some ancient city ruins in Turpan, and experienced Uyghur culture and bargaining within the bazaars and markets of Kashgar. 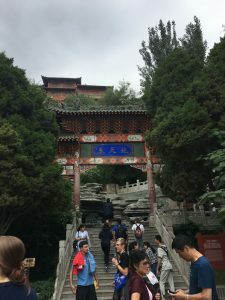 Since so many things happened in each city we visited, I will be dividing the Silk Road into a series of blogs, each describing our adventures in one city. So let’s start with Xi’an. In the few days leading up to departure day, we spent our time buying last minute things and packing our bags. It’s an art to make sure that you bring just enough stuff to last you for two weeks but not too much stuff that you’re stuck lugging extra weight around for the entire trip. 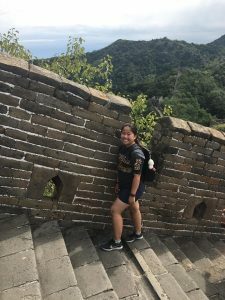 Personally, I brought two backpacks: one that had my clothes and toiletries, which I wore on my back, and one that had my important items, such as my passport and my wallet, which I wore in the front of me. If you can imagine me waddling around with two stuffed backpacks like a penguin, you have the right idea of Justine on the road. 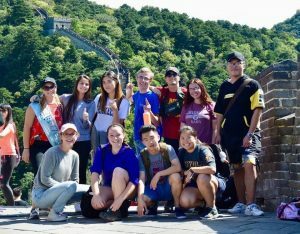 Our group consisted of the 29 students who make up TBC’s Fall 2018 student body plus 5 “trip leaders.” The trip leaders basically made sure we as a group didn’t fall into complete and utter chaos, but they were extremely good company. I became close with many of them through random shenanigans. Our first destination was the city of Xi’an, known as Chang’an during the Tang dynasty. It had historically served as an ancient capital of China. The city had seen about 11 Chinese dynasties over a period of about 4,000 years. To get there, we took our first overnight train of the trip (the first of 5 trains). 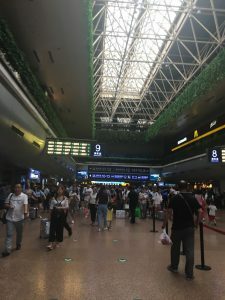 Here in China, getting onto any sort of train, whether it be overnight or subway, requires you to go through security, and it’s something similar to airport security. I’m sure you’re quite familiar with the process: you put all of your bags through an x-ray machine, then you walk through that gate thing that you pray doesn’t beep when you walk through it even though you logically have nothing problematic on you, and then afterwards, it’s a mad scramble to grab all of your things so you’re not the one holding up the entire line. But anyways, all 35 of us headed to our designated waiting room once we passed security. We followed one of the trip leaders who held up the iconic red TBC flag so we wouldn’t lose track of the group’s location. Holding the flag was jokingly called the most powerful thing to be wielded throughout the trip, and the person who held it had unlimited power because they decided the group’s fate. If one of the students happened to get ahold of it, even for a few minutes, it was the most universe-exploding thing ever. In the waiting room, where our “departure gate” was located, we plopped all of our stuff in the middle of an aisle in-between waiting seats, since all of them were already taken. 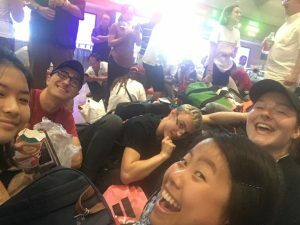 You can imagine the look on some of the Chinese natives’ faces when they saw a huge group of foreigners just chilling out around a fortress of backpacks and suitcases. Multiple times throughout the trip, whenever we would pull out a deck of cards to pass the time, it wasn’t unusual for us to have some curious Chinese folks watching us play card games. Inside the first train station. Waiting for our first train to Xi’an! After a few hours of waiting, we boarded our first overnight train. 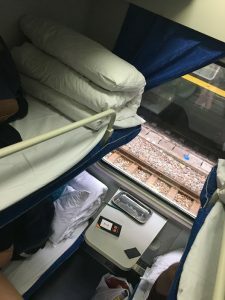 It was the first time any of us students had gotten on an overnight train, and luckily, our first experience was quite pleasant. Most of everyone was in the same train cart, and all of the beds were freshly made. The layout of the cart was rows of three beds stacked on top of each other on one side with one small hallway on the other side. The first overnight train bed I slept in was the middle bunk, so I had to climb up a ladder to get into my bed. I remember most of that night was spent talking to the people in my row before all of us knocked out for the rest of the 11 hours of the train ride. As you can see, space is limited in an overnight train. This picture was taken when I was sitting on my middle bunk on the right. Our train arrived in Xi’an early the next morning. My first impression of the city was that it was beautiful. 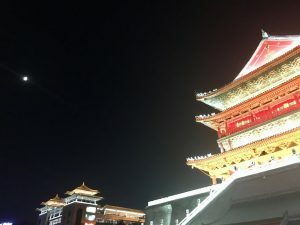 Unlike most city walls in China, Xi’an’s 9-mile long, rectangular city walls still exist, and as we walked around the city that early morning, groggy from the overnight train, those walls were a sight to behold. The sun seemed to greet us as it rose higher and higher in the sky. We met up with our first tour guides of the excursion, two very sweet local women named Julie and Sophia, who led us to our hotel. After briefly dropping our stuff off at the hotel, we hopped onto our bus and were driven to see our first sight-seeing destination: the Terracotta Warriors Museum. 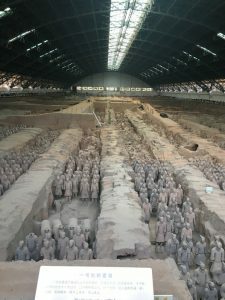 To briefly explain, the Terracotta Warriors, an army of over 7,000 life-sized clay soldiers, archers, and horses, were made to protect the tomb of a Chinese emperor, Qin Shi Huang. They were discovered by peasants digging a well in 1974, and a total of 3 “pits” were found, the first one being the most popular because it holds over 8,000 soldiers, all standing in battle formation. The warriors, being made out of clay, had been found in pieces, but over the years, scientists worked diligently to piece them together and arrange them in the pits the way they had been buried all of those years ago. If I remember correctly, Sophia told us that only about 25% of all the warriors have been successfully put back together. Yeah, 75% of the Terracotta Warriors aren’t put back together yet. The moment we were released to explore that first pit, we got a firsthand account of how popular it was because there was probably hundreds of people trying to wrestle their way to the front of the balcony in order to get the best view of all of the warriors. If there is anything good about being small, it’s that you’re able to wrestle and squirm your way through crowds pretty easily. 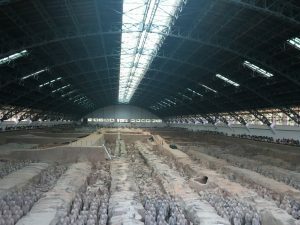 In this case, it allowed for me to get the best view of all of those Terracotta Warriors. The result of me wrestling to the front of the crowd. Let me tell you, to see all 8,000+ statues standing in line and staring back at you blankly in person was something else. The pictures I took can only mimic the chilling feeling of all of those eyes staring at you. It felt like they all, at any time, could take a step forward towards us. 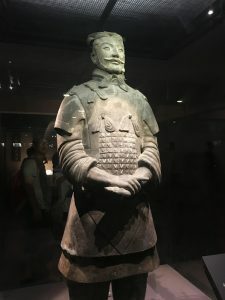 The sheer number of them was enough to be taken aback, but the fact that they all were so realistic made it that much more impactful (every warrior had been sculpted after an actual soldier in the Qin Shi Huang’s army). It looked like that even thousands of years after they were built for their emperor, they were still ready to fight for him. The second pit had statues in glass boxes so we could get a closer look at them. Before they were buried, the Terracotta Warriors were painted, but upon excavation, exposure to oxygen made the paint oxidize and fade away, leaving the warriors to pale brown color that they are today. But one on display in second pit still had some remnants of paint on him, and my mind wandered at the thought of how he could have looked like if he still was fully painted. Just one of the restored Terracota Warriors. After the Terracotta Warriors and recuperating in our hotel rooms for a bit, we walked over to the Big Mosque, one of the largest mosques in China. I wasn’t so sure what I was expecting for a mosque in China, but I was pleasantly surprised at the amount of Chinese-styled architecture in the buildings. They were elegant and very much Chinese-styled, yet they are still used to this day to practice Islam. We were given a tour and a fascinating lecture on the history of the mosque. Group photo at the beautiful Chinese-styled Big Mosque. Then, we were given free time for dinner. My friends and I, after wandering around in a street filled with stores selling all kinds of trinkets at a bargain-able price, instantly decided to get some street food along Muslim Street. We had walked past it on the way to the Big Mosque, and our curiosity just couldn’t be contained. Muslim Street was filled with food stalls and stores and brilliantly lit up colorful lights, and it was crowded with hungry people trying to get tasty cheap treats for dinner. I remember the addicting smell of roasted meats and spices and the enthusiastic yells of street vendors. 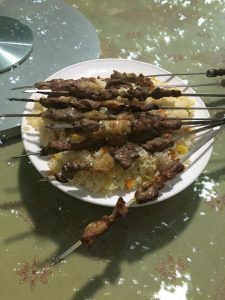 Usually, the food was prepared right in front of you — I vividly remember the hanging meat carcasses and cooks carving meat right off of them before throwing them on a grill. 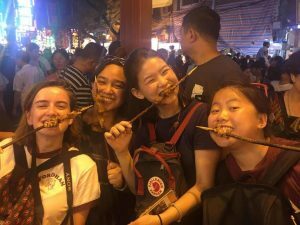 My friends and I managed to get our hands on some that meat grilled to perfection on a stick (like an actual wood stick) and this fried crispy bun that was filled with meat and onions. 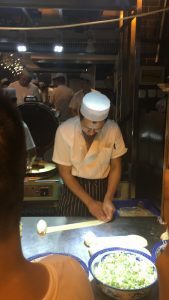 While we waited for our meat buns, we watched as chefs rolled and folded the dough with their experienced, fast hands, and then flatten them before putting them in a large fryer. The exterior was light and crispy, while the inside was bursting with meat-y and onion-y flavor. The filling just melted in your mouth. It was the best thing I put into my mouth that night. The best part was, I seem to recall that it was less than a dollar. In fact, most of the food that we got was all less than a dollar. Grilled meat on a stick — yum! Chef at work, rolling the dough for the crispy meat buns. 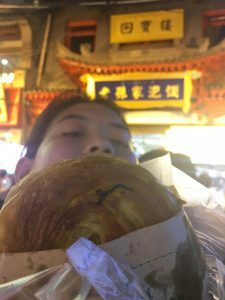 That crispy meat bun was the best thing I ever put in my mouth that night. With full bellies, we wandered back to our hotel, enjoying the lit up pagodas and streets. I remember the night air being very comfortable, and I remember thinking how much we had already done in the first two days of the trip. Needless to say, we slept very well that night. 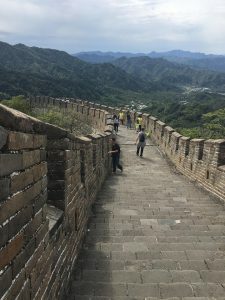 The next day, we were given a choice in activities: we could either bike along the top of the city walls or we could walk over and explore the Forest of Steles. Because I would rather eat ice cream than become ice cream in the heat and humidity of the day, I chose to go to the Forest of Steles. The Forest of Steles is a museum that houses over 1,000 steles, or stone pillars that are carved for commemorative purposes. Most of them are carved with the teachings of Confucius, a Chinese scholar whose teachings became what is now known as Confucianism. 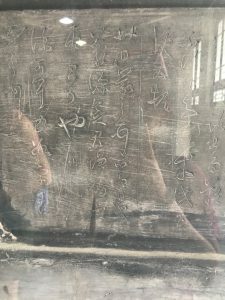 Some of the steles were able to be touched, and I marveled in awe at these ancient pillars as I traced my fingers along some of the characters etched in the stone. I was even able to recognize some of the characters from my knowledge from studying Japanese. My friends and I wondered out loud what the carvings said and how Confucian scholars were able to carve characters into stone so beautifully many times. In addition to the many steles, there was a special exhibition that showcased Buddha and bodhisattva statues amongst other Buddhist items, which was interesting to look at as someone who comes from a Buddhist family. After leaving the Forest of Steles and grabbing some lunch on our own, we regrouped with the people who had went biking and were driven to a museum dedicated to the Silk Road, where we were given a tour by one of the staff. There, we saw original coins used by merchants to trade on the Silk Road as well as some discovered goods that are thought to have been traded along the route. 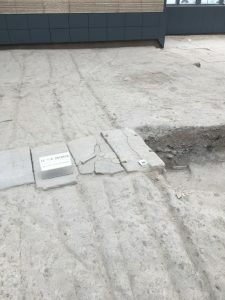 We even saw the original preserved ground that still had tracks of the carts that came to Xi’an all those years ago. If you look closely, you can make out the preserved tracks left behind by the wheels of merchants’ carts that traveled along the Silk Road. To put this into perspective, the Silk Road is thought to have started around 200 BCE, and this museum still had the imprints of the wheels of merchants’ carts from that long ago. Even now I can’t really grasp at how ancient the things I saw in Xi’an were. 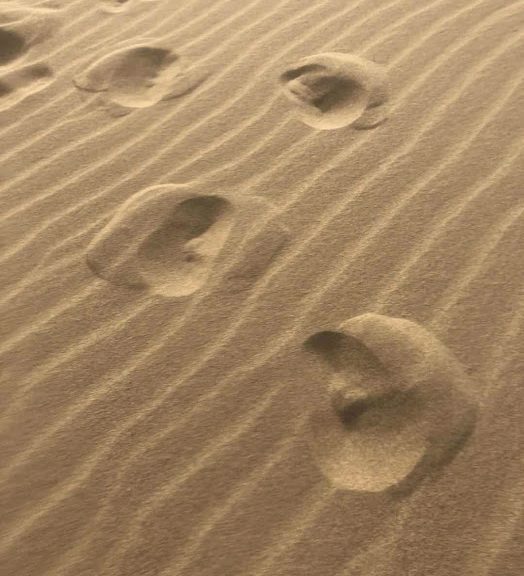 Looking at the imprints on the ground, I could just imagine the merchants coming into Xi’an to start their journey on the Silk Road. It just really made me put what I knew in perspective. The United States, based on when the Declaration of Independence was signed, is only about less than 250 years old — the Terracotta Warriors were built over 2,000 years ago. The Big Mosque that we visited was built in 742, more than 1,000 years ago. 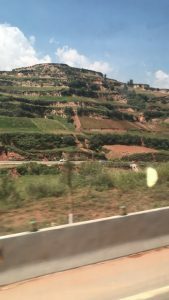 But before I could even process all of that, we had to hop onto another overnight train to get to our next destinations: Xia’he and Lanzhou. Come back next time to hear about it!